After a long drive from Las Vegas to Los Angeles, we stopped in the famous district of Hollywood! Hollywood is known for it’s place in the entertainment industry. We stopped at Hollywood Boulevard to see the Walk of Fame, the Dolby Theater (where the Academy Awards is held), the Chinese Theater, and the Hollywood sign. The Walk of Fame in Hollywood is comprised of over 2,500 stars! Hollywood is known as an extremely interesting neighborhood. People from all over the world know about Hollywood’s history in the motion picture industry. All along Hollywood Boulevard, there were people in costumes dressed as famous movie characters to take pictures with tourists (for tips!). There were also tons of souvenir shops lining the boulevard. Although Hollywood doesn’t have the same role in the movie industry as it once did (many movie studios have moved out of Hollywood and into other LA neighborhoods), it still attracts millions of tourists each year who appreciate its history and its diversity and liveliness today. After spending some time in Hollywood, we made a trip to downtown LA where we visited the Los Angeles Music Center. Here, we saw the Walt Disney Concert Hall and the Dorothy Chandler Pavilion. We also saw the City Hall building and were able to take plenty of pictures of the “Peace On Earth” Fountain, one of the most iconic fountains in Los Angeles. The Dorothy Chandler Pavilion is famous for housing the LA Opera and previously was the location of the Academy Awards Show and the LA Philharmonic. 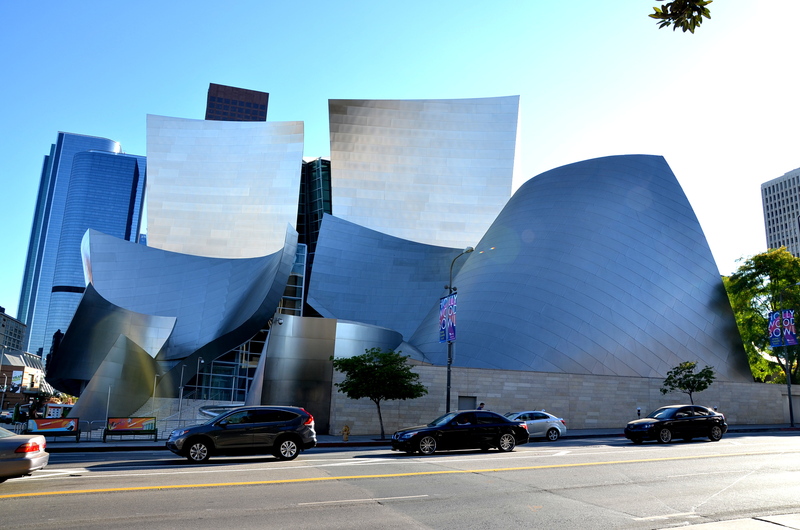 The Walt Disney Concert Hall is known for it’s stunning architecture and for being one of the most acoustically sophisticated concert halls in the world. It is the current home for the LA Philharmonic as well as the Los Angeles Master Chorale. This entry was tagged dorothy chandler pavilion, hollywood, la, los angeles, walt disney concert hall. Bookmark the permalink.